Konkol, an ordained minister of the Evangelical Lutheran Church in America (ELCA), has a diverse and global background of service, ministry and teaching. 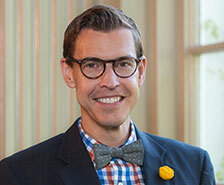 Prior to his appointment to Gustavus Adolphus College, he served as co-pastor of Lake Edge Lutheran Church in Madison, Wisconsin, with responsibilities surrounding multicultural engagement and public advocacy. From 2008 to 2012, he served in South Africa as country coordinator of the Young Adults in Global Mission program of the ELCA. He also assisted in parish ministry alongside isiZulu-speaking congregations of the Evangelical Lutheran Church in Southern Africa, lectured at the Lutheran Theological Institute and participated with the World Council of Churches and Lutheran World Federation in the Conference of the Parties to the United Nations Framework Convention on Climate Change. From 2003 to 2007, Konkol interned with and later served a parish with the Evangelical Lutheran Church in Guyana, where he also lectured at the Lutheran Lay Academy and co-hosted the nationally televised broadcast “Word for the World.” He served on a variety of community organizing committees, many of which focused on ecumenical and interfaith cooperation, poverty, children and youth development, and ecological sustainability. Konkol is originally from Amherst Junction, Wisconsin. He is a graduate of Amherst High School and earned a bachelor of science degree in criminal justice from Viterbo University, La Crosse, Wisconsin. He earned a master of divinity degree from Luther Seminary in St. Paul, Minnesota, and master of theology and doctor of philosophy degrees in the School of Religion, Philosophy, and Classics at the University of KwaZulu-Natal, South Africa.